by Marschark, Marc, Lang, Harry G., Albertini, John A.
Marschark, Marc, Lang, Harry G., Albertini, John A. 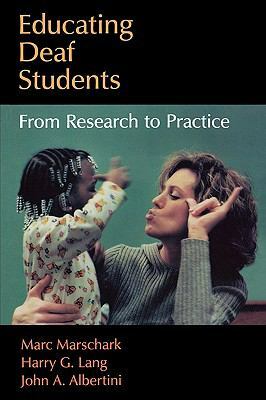 Using a research-based but readable approach, this work considers what is known, what is not known, and what should be known about the education of deaf students.Marschark, Marc is the author of 'Educating Deaf Students From Research to Practice', published 2006 under ISBN 9780195310702 and ISBN 0195310705. Loading marketplace prices 131 copies from $0.51 How does the rental process work?